Pastor Maunda called from Kibwezi this week, very excited. He said that every Sunday since we showed The Jesus Film he has had new people attend his church. Just this past Sunday, three more showed up and received Jesus as their Savior! Praise God - seeds are still sprouting! Please join us in praying that the new believers in Kibwezi will become well grounded in the Word of God, grow strong and win others to Christ! It is so exciting to see "fruit" from the "seeds" that were sown in Kibwezi. It only happened because people prayed and gave so we could take The Jesus Film to this village! We are honored to be part of what God is doing!! Last Saturday Don and I headed out on our first long distance trip alone. Our driver Jeremiah resigned, but Don said he could make the nine hour drive. I wasn’t so sure but I prayed and felt God saying “I’ve gotten you this far in Africa, trust Me.” Remarkably I was not fearful and for the most part I didn’t “help” Don drive! Our destination was Carry the Light Orphanage in Usigu Kenya on the shore of Lake Victoria near the border between Kenya and Uganda. Our friend, Rachael Howington from Rockwall spends 3 to 6 months at a time there. The orphanage cares for 97 orphans. 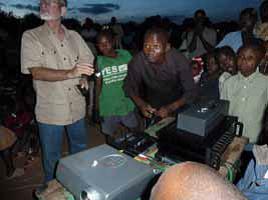 We took The Jesus Film equipment along to show the movie to the children and the community. Saturday evening Pastor Joshua asked if I wanted to teach Sunday School to the adults. At first I declined because I was afraid I wasn’t prepared. Don said he would teach the class and preach in the main service as well. Later that evening I felt God telling me that I could teach what He has taught me about Bible study. So I began to outline what to say and He gave me illustrations and even a visual aid! Sunday morning I was eager to teach the class. I left them with the tools God had given me back in Texas last year! We reviewed and practiced. I now know I am sufficient because my sufficiency is from God. Don preached on the Kingdom of God and that the Kingdom of God is here on earth. He told them the parables that Jesus taught on the Kingdom of God. God has given him such an insight into Kingdom living that is applicable to life no matter where you live. Sunday afternoon Don and Pastor Joshua walked through the village. On their way to visit Elijah, a member of Joshua’s church, they saw a group of about 15 men sitting and talking. Don went and greeted them and introduced himself. He then said that he wanted to ask them a very important question. He asked them if they knew Jesus. They said yes. He then asked if Jesus was Lord of their lives. One man spoke up and said they were all Muslims. Don then replied that Jesus is the prophet “Isa” that is in their Koran and Isa is alive to this day! He invited them to come and learn more about the life of Isa from The Jesus Film we were showing the next night. Two or three of the men said they would come. When Don and Joshua arrived at Elijah’s door, he invited them into his small house. They sat down and after the usual greetings Elijah looked at Don and said “I want you to teach me Bible." So Don sat with him and began telling him the story of Elijah’s life. When Don finished he showed Elijah in Elijah's own Bible the scriptures he just taught him. Don told him to read for himself, because when he reads for himself what the Word of God says, no man can lead him astray. God truly showed Himself sufficient during our trip to Usigu. He was sufficient to provide the Sunday School lesson, when I was not. He was sufficient to share with the Muslims about their prophet Isa and use that as an opening to spread the Gospel. He was sufficient when a man just asked “teach me Bible." Please pray that our time in Usigu will reap much fruit. Also pray for the 97 orphans and those that care for them that they will grow in the knowledge of God and His Kingdom! We pray you will all have a wonderful celebration of Thanksgiving next week. We have truly added to our list of what we are thankful for this year! We stand in awe of all that God accomplished during our short time in Kibwezi. 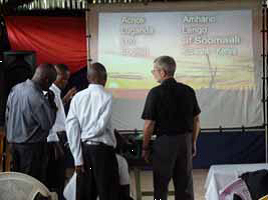 We began on Saturday morning with a training session for pastors and church leaders. Don taught on how to do follow-up with individuals after the showing of The Jesus Film based on Jesus’ parable of the sower in Mark 4. He discussed how to share your testimony and discipleship training for new believers. The first showing of the film occurred that evening. The film was shown outdoors in the town center of Kibwezi. We had an estimated 800 people in attendance. This was a great surprise to us because we had expected a crowd of no more than 300. The film began at 7pm but was cut short at 8:15pm due to rain. We were forced to take measures to protect the equipment from moisture. Also, people were beginning to leave because of the rain. We did, however, cover the amplifier with a blanket and umbrella so that Pastor Maunda could explain God’s plan of salvation and call for anyone wanting to follow Christ to come forward. He then led them in a prayer for salvation. About 70 people responded (not counting the younger children). Don remembers watching a young boy, perhaps 10 years of age, with his head bowed and eyes closed. As the rain fell on his head and ran down his face, he repeated the sinner’s prayer as led by Pastor Maunda. Tears fell from Don's eyes as well. We had been specifically praying that the gospel message would reach some of the Muslim population of Kibwezi. The next day, we heard a report from one of the churches that a Muslim man showed up for worship testifying that he had been saved at our meeting the night before. We do not know how many more Muslims had been reached because the rain made the afterfilm follow-up more difficult, but if we heard the testimony of one, we feel certain that there were more. Also, some of the people that our team talked with after the film were very hesitant to give their names which would be typical of Muslims that were concerned about subsequent persecution. Please be in prayer for these new believers. The second showing of the film occurred on Sunday evening.The film was again shown in the open area in the town center of Kibwezi. We had an estimated 1,700 to 2,000 in attendance. Again, the numbers were a tremendous surprise to us. When we were shopping for the audio equipment, we tried to size it for a crowd of 2 or 3 hundred, so we were looking at a 100 watt amplifier. Before the purchase, we decided to increase to a 250 watt amplifier and add speaker stands to project the sound better. This turned out to be the correct decision. We had also purchaed a generator and DVD player. The total cost (in American dollars) for this equipment along with the cost of electrical connections came to almost exactly $1,600. During the film, Don was sitting on the ground (there were no chairs or benches provided for anyone) so that he could be close to the projection and audio equipment. This was very near the front so he could not see more than a few hundred of the crowd that had gathered. About half way through the film, he decided to get up and walk around to stretch his legs and to get a better idea of how many were in the audience. He was astounded at what he saw. This large open area, which was much larger than a soccer field and which could hold several thousand, was half full of people. From the rear of the crowd, the sound was not loud, but could still be readily understood, and the screen was small, but could still be easily seen. Don whispered to himself, “Thank you, Jesus. There has to be at least 2,000 people here”. The final estimate was between 1700 and 2000 in attendance that evening. We stopped the film at the end of the movie, as the film depicted Jesus’ ascension to heaven, and before the film presented the final salvation message. Pastor Maunda, very concisely, summed up the message of salvation, called for those wanting to receive salvation to raise their hands and then led them in a prayer to receive Christ as their savior. 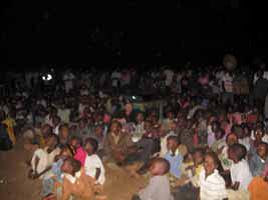 Pastor Maunda estimated the response (excluding children) to be about 200 people. We had nowhere near enough altar workers, so we handed out flyers to many of the people explaining how to find Pastor Shadrack Maunda’s church along with meeting times for services and Bible study. We know that we serve an awesome God and yet He continues to amaze us. We appreciate each of you who prayed for this weekend ministry! “PLANTING” THE WORD IN KIBWEZI! Friday morning we loaded our generator, speakers, amplifier, projector, screen and microphones and headed out to Kibwezi, Kenya!!! The rainy season has begun in Kenya. As we traveled we noticed farmers walking behind two oxen and a plow preparing their fields for planting. We actually saw five different farmers along our route. This was significant because of what happened BEFORE we left for Kenya. Last March, Pastor Ghiorghi, a pastor friend of ours from Romania attended our home church’s Missions Conference. He looked Don in the eye and told him that as he was praying for us the day before God gave him a message for us. “Just like Elisha, you are to slay the ox and burn the plow.” Don was stunned. He knew exactly what this meant. For several months, he had been teaching on the life and ministries of the prophets Elijah and Elisha. God was confirming that our planned 3 month mission this fall was just the beginning of a much longer time working for His Kingdom in the nation of Kenya. Then in May, our adopted son, Sastry Meesala’s brother and father came from India to see him graduate from Dallas Baptist University. We had “adopted” Sastry after we met his family in India in 2008 on a mission trip. His brother brought gifts to those who had helped Sastry in the U.S. When Don began unwrapping his gift we were amazed! It was a man behind a plow pulled by two oxen! (see photo). Sastry’s brother told Don that as he was shopping for the gift in India he felt God urging him to bring this as being symbolic of Don’s call to Africa and India, just like Elisha has been called by Elijah! He had no way of knowing how significant his choice was! So Friday as we were coming into Kibwezi, and seeing the fields being plowed by oxen, I was reminded that we are working in the fields of our Father God. He has prepared us to come to Kibwezi. He supplied all the things necessary for the showing of The Jesus Film. It is just like God to bring us here at planting time so we can plant the seed (The Word of God) in the hearts of these villagers! Thank you to everyone who has partnered with us to make this time of ministry possible! We appreciate your prayers and financial investment. Please continue to pray the next two days for Kibwezi! We will let you know what great things God does here!